What do you do when your child is sick in bed for the second day in a row? Climb right in with her for a little crafting and storytelling. Using the old fashioned method of cutting accordion folded paper, we created an instant village among the snowy white mountains blankets. We took turns making up silly tales. When my daughter was ready to return to the stack of books at her bedside, I couldn't resist snipping some little acorns. I had been dreaming of a mixed fall leaf chain, but frankly my sleepy brain (lots of middle of the night waking going on these last couple of days) and uncoordinated fingers needed something easy. Later on, when we both felt a bit more energized, we went downstairs and applied some watercolors. Both of us are happy with how they turned out.Quite. 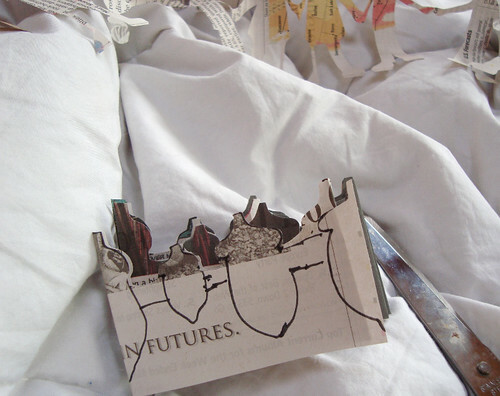 I get a crazy amount of satisfaction out of cut and painted newspaper, as you well know! We'll be returning to these kinds of chains even after her sore throat disappears. the acorn chain is very beautiful! i love the acorn chain! i love that acorn chain. so cool. 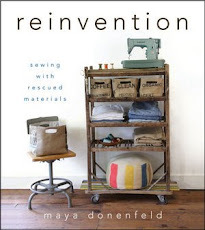 You are so right about using things at home to craft with. We don't always have to have the latest toy for our kids to play with. There is so much fun to be had with things we already have. Thanks for the reminder. 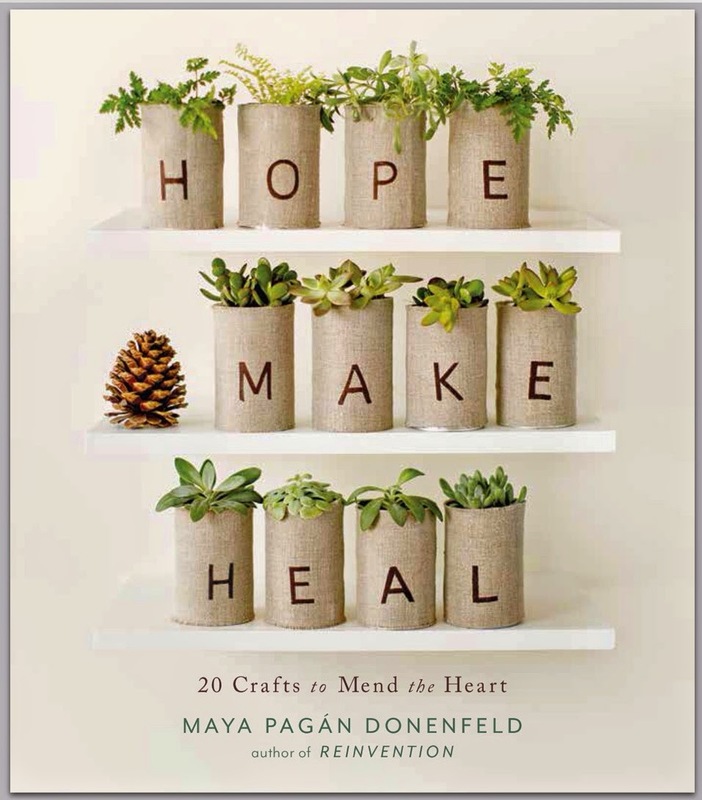 oh thank you for the reminder to use what we have - these are just the perfect fall craft! and i find that kids really have some much more fun when its about creating and crafting their own toys! These are so great Maya! I'm tempted to dig in the neighbor's trash to find some newspaper now. None in our house, I miss it for crafting! Very resourceful you are, and I love it! The acorn chain is fabulous; thank you for sharing!!! you had me a leaves....and the acorn chain is over the top good....well done you! That acorn chain is so lovely! We don't get the newspaper so I'll have to beg some off the neighbors! It's just too cute not to make! Such a cool idea! I love the happy little acorns. 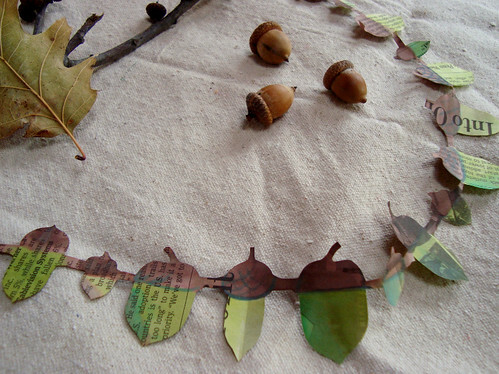 I don't have any little ones around to craft with, but maybe I'll make some paper acorns of my very own to (please? hopefully?) usher in fall. We love paper chains!!! We love watercolors!!! We should definitely connect the two, they look lovely!!! Hope your little one is feeling totally well soon!!! What a fabulous idea for a sick little girl. 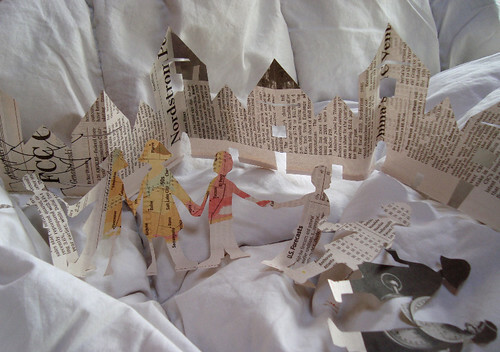 All of the paper chains are so charming! I love them all, and will remember this idea if my own little girl needs a sick-craft! I love, love, love working with newspaper. There's something so simple about it, I feel good re-purposing and the possibilities are endless. This idea is fantastic! Lovely!! !I am going to make something with the opened up envelopes. What a lovely idea! One more thing to do at the weekend! Thanks! Love the results here. Thanks for the fabulous inspiration! 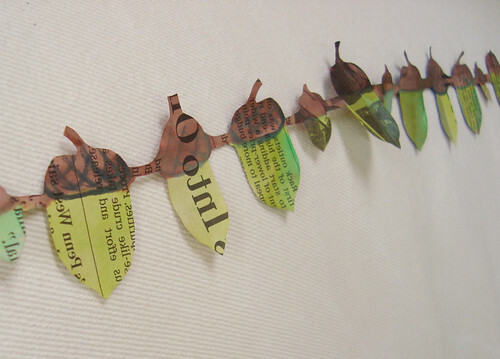 Your paper chains are one of the most delightful and original craft projects I have seen in years. I linked to this page and the original paper chain page from my blog Don't Blame the Kitchen because once I saw them, everything else I thought of putting up seemed pretty lame. My daughter and I are daily visitors. Thank you.